The event will be on electro-music radio on Saturday March 23rd 2019. 6. Description (Style/Genre/Equipment, etc. - Optional): See below. There is a brief taste of a new melody that I stumbled into, improvising during the final 2.5 minutes of my June 2018 banjo-centered solstice piece *Take Cover Part II*. I plan to work up a piece starting with that melody, on processed electric banjo, for the first 15 minutes. Depending on how that prep goes, I'll segue into either 15 minutes of processed acoustic banjo, or software no-input mixer, in which I feed outputs of my MOTU audio box back into the inputs, and process the feedback loops via Ableton Live. I have used this mixer-less approach -- no-input, no-mixer -- when teaching zero input mixer workshops at electro-music festivals, but I don't believe I have ever performed that way. You can do an awful lot, just running the feedback loop through an 8-tap EQ. EDIT: Posted a link to this thread on two FB EM pages. All right, last show before my retirement and relocation! Sound compositions made with Beads/Java, MAX, with live overlay via Push and various Moog synths. Welcome to electro-music, Miles! By way of introductions, Miles and I both teach at Kutztown University of PA, and among many other things, Miles has played in several of our planetarium EM events. Great to see you here. 1. Preferred Start Time (Please use GMT/Military Time):later afternoon / early night time. 8. Anything else you like to mention: volunteering for broom duties. Thanks for organizing this. Twyndyllyngs would like to play at the regularly scheduled time of Chez Mosc. 1. Preferred Start Time: Usual start time or later if needed. 6. Description (Style/Genre/Equipment, etc. - Optional): Experimentalism! My piece this weekend will be in Dm, the saddest of all keys. signup is closed and schedule is final, at least if it is ok with everyone so please check. I might stream some spring sounds before the official start of the event. I'm curious, what is the reason for calling Dm out in particular as the saddest of all keys? Curiousity, nothing more. Oh, it's just that This Is Spinal Tap scene in the Youtube clip. The movie is a musical spoof, followed up years later by many of the same people doing A Mighty Wind, which is a really great spoof of the 1960s folk music scene. When I told my son I'd be playing the piece in D minor, he immediately responded, "Oh, the saddest of all keys." We converse in Spinal Tap. It's going to be tight, but if nobody minds me leaving quickly after my set I'm good. That's what comes of listening to jazz. Parts of those changes sound a little like Hotel California. Not really, though. Sadly I have still not managed to get connected. I thought I was so close! 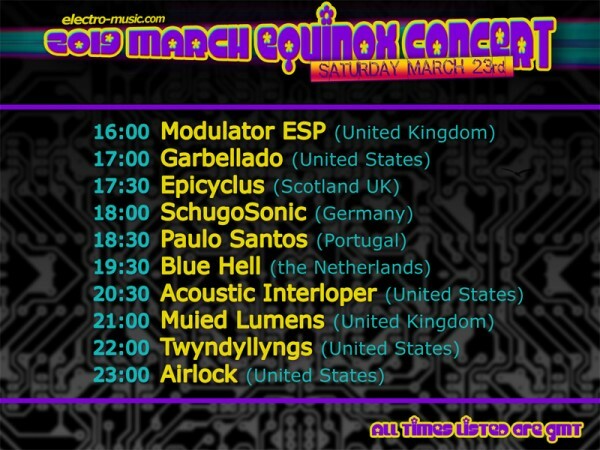 I am schedule for 17:00 Saturday Garbellado. I will keep trying but not looking to promising at the moment. Update later Friday night. I am now connected! on 8130 Will continue trying a few things so I can be reasonably assured of it working Saturday!